Dave Moore and Stuart Watkiss are the current joint Caretaker Managers after Paul Hurst left for Shrewsbury recently. 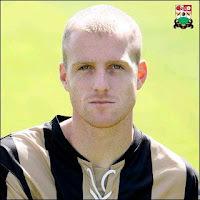 Dace was a Full Back at Grimsby, Blackpool and Darlington and has managed at Scunthorpe United while Stuart was a defender who had spells with Mansfield Town, Hereford Utd and Walsall before managerial experience at Mansfield and Kidderminster Harriers. The first thing to remember is that the ground is in Cleethorpes and not Grimsby. For you Motorway enthusiasts the M1 and M180/A180 will take you straight into the heart of Grimsby and staying on this road you will see the Stadium. However the trusty A1 will get you to Newark-on-Trent where you take the very pleasant A46 signposted Lincoln. This road is basically all you require as when you reach Grimsby look for signs for Cleethorpes and signs for the ground. Failing that head for the seafront and you will see the floodlights! No car park I am afraid but all the local streets are unrestricted. A train from Kings Cross to Cleethorpes will take around 3 hours including a change at Doncaster or Newark. Cleethorpes station is only a goodly 25-minute walk to the ground. Basically turn left out of the station and head for the sea front. You will eventually see the ground on your left. Please note Grimsby station is a long way from the stadium. If travelling by boat from the North Sea head west towards Cleethorpes and you will see the floodlights straight-ahead. Inside the ground away fans are offered a dedicated bar with TV and serves up a very decent pie and peas. Outside the ground is The Imperial and the Blundell Hotel, which are advertised as a home only pubs but I had a very pleasant drinks in there without a problem last time were there. They are adjacent to the ground on Grimsby Road. The Rutland Arms also on Grimsby Road is 10 minutes walk north from the ground offers real ales in abundance. Haddock and Chips is in the blood of folk from this part of the world and The County Fish Bar 277 Grimsby Road is perhaps the best plaice to sample it take a way style, don’t miss out! 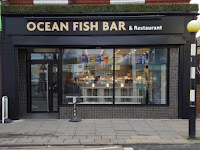 I found the outstanding Ocean Restaurant in St Peters Avenue in the town for a sit down job. 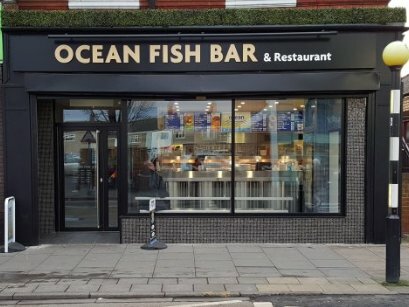 Extensive menu including steaks, ribs and fish, very reasonable prices, and has my personal recommendation for a pre match meal. In fact I have received numerous texts after the years about the quality of this establishment and once a very personal recommendation from the late but one and only Dennis Signy as he took his Lady wife Pat for dinner there on a couple of occasions – oh how I miss that gentleman. 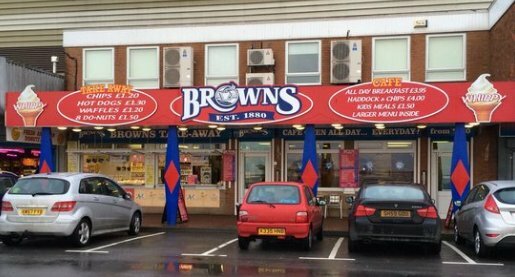 For a good old-fashioned fry up or all day roast dinner seek out Browns Restaurant on Cleethorpes' Promenade. With a capacity of just over 9,000, the tall Carlsberg Stand, formally the Findus Stand, was built in 1980 and is the focal point at Blundell Park - It dominates the ground. It seats around 3,000 in two tiers. The view from this stand is one of the finest in football and it can be clearly seen from the ferry on the Humber Estuary. To the left is the Pontoon Stand and to the right the Osmand Stand which is the area reserved for visiting fans. They both provide covered seating for around 2,000. Finally we come to the main stand. A section of this remarkable stand is I believe the oldest surviving structure at a League ground. It is dates from 1901 and is the central section closest to the Pontoon stand. The stand was extended to meet the Osmand Stand in 1931 and now seats 2,300. The club was hoping to relocate to a new ground on the western outskirts of Grimsby at Great Coates, adjacent to the A180 dual carriageway. This has now fallen through and another site is being considered at Peakes Parkway about 2 miles from the current stadium. We last met in the conference in January 2015 when a John Akinde Penalty was not enough in a 3-1 defeat in front of the BT Sport Cameras. Our last meetings were in League 2 in2009/10 when each team won at home. The 3-0 Barnet win featured goals from O'Flynn, Adomah and Bolaise. 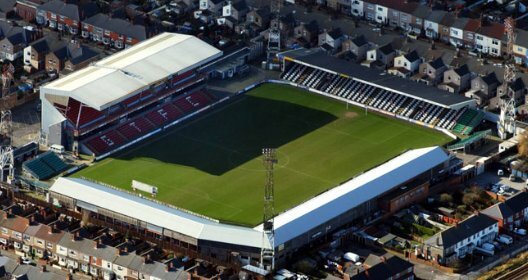 A 2-0 defeat at Grimsby in May 2010 was a lifeline for the mariners at the time but they were still relegated to the Conference a week later. Barnet's only win at Blundell Park was in September 2008 when a Neil Bishop goal bought home the spoils. Oh yes it’s seaside time once again. Candy Floss, Toffee Apples, Doughnuts freshly prepared while you wait, Bingo and of course “in and out shops” galore! 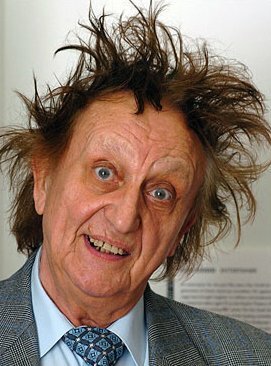 One of my countless Barnet FC related dinner party stories is the one about Mrs Reckless and I sleeping in the same bed as Comedian Ken Dodd (not at the same time I hasten) as he stays in the Tudor Guest-house when he is on tour. 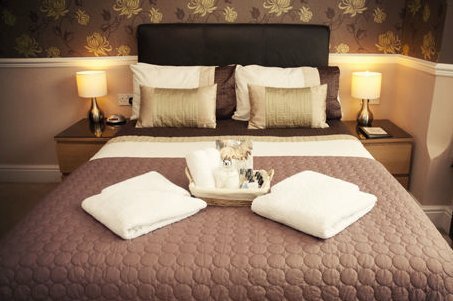 He first stayed there in the 1960's. Diddy? No Doddy! Seriously lovely hospitality and run by the same family for 50 odd years and they take great pride in recounting stories of the comedy legend. (Smoked Kippers were even on the Breakfast menu - splendid). I am available for after dinner speaking by the way, reasonable rates etc. How He Looked when he got out of it! The following F list celebs and Barnet players have been spotted on the seafront over the years, Big Daddy, Captain Birdseye, Roy Chubby Brown,Gary Breem, Kevin Mullett, Lee Roach, Robert Codner and Elton John of course. Bit fishy? Yeah.